Judy Henderson | His Kids Too! I have been to Ukraine 5 summers in a row mostly to direct the children at Summer Bible School at one of the elementary schools and an orphanage boarding school. This experience has changed my life; it changed the way I look at my life and the life of our US children. It changed the way I teach. It changed the way I live my life. I am so much aware of the waste the US goes through, how much we take for granted. Like running water, flush toilets, electricity, food (do you know we do "art" projects with food that could feed 20 children? ), and transportation. The excuses we can come up with for not worshiping our Lord. "My car would not start", etc. I met a man in the Ukraine who rode his bike to church every Sunday (while he was alive) 7 miles one way I was told. And children who walk to school for the Bible classes with holes in their shoes – they were always early waiting for us and anxious to begin. (Are the children you teach on time? anxious to learn? can't get enough of God's Word? ), and there were very few behavior problems – because they WANTED to be there! It is such a wonderful experience to spend time with the children , to get to know them and play with them and just to let them know we care about them. Not only were my skills of comunication improved but my photograghy improved – you just can't help but take pictures of them – not only to remember them but because they are so much fun. I'm enclosing a picture of 2 girls I took last year – best friends – and I won 2nd Place at the North Florida Fair with the picture. 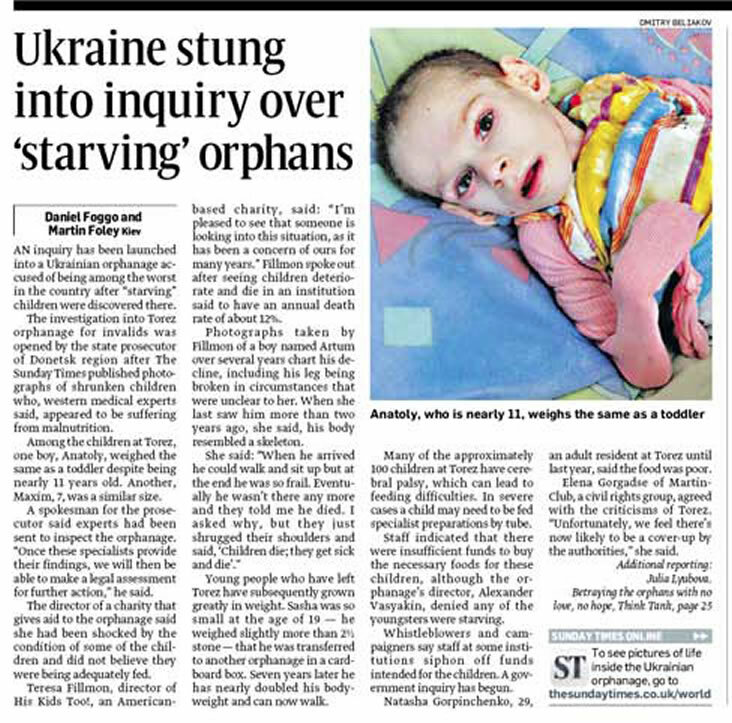 If you want a fantastic trip go to the Ukraine and help with the Bible school or with Teresa & Rich as they visit orphanges and deliver food, clothes and toys. The look on the children's faces will bring you to tears and it is such a feeling of pleasure to know you had some part in bringing a little happiness into these children's lives. What can I say – they gave me so much more than I gave them!